The Best Trade Show Display Booth Supplier Located in Southern California. Trade Show Island Exhibits, Fabric Display Signs and Low Cost Portable Displays. 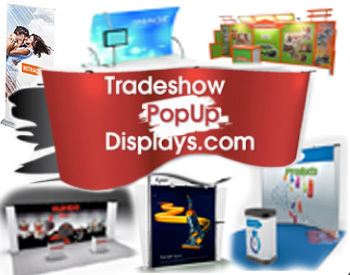 An exceptional array of high quality Pop Up display booths made here in Los Angeles. We offer both curve and straight wall displays in addition to 6Ã­ and 8Ã­ Table tops, all with a lifetime Guarantee. An exceptional array of high quality Hanging Sign displays made here in Los Angeles. We offer both curve and straight hanging signs, all with a lifetime Guarantee. High quality fabric graphics are the way to go when you need visibility high up on the show floor. The idea is to be able to have either a large structure or attention getting graphic images over your booth space that accomplish two things. First, the sheer real estate you own in the air space that came with your exhibit basically doubles the size. The new Solar Exhibit Sytem Eclipse shadows other comparable modular exhibit systems. Design, architecture and functionality await notice. This isn't an ounce of excess. 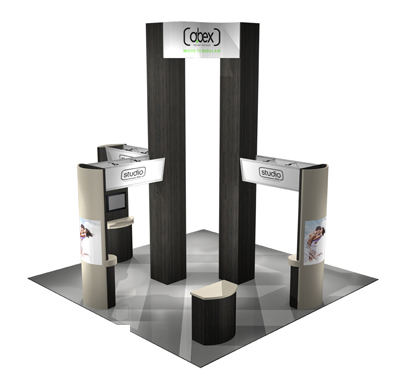 Tradeshow Displays in Los Angeles sells Abex Exhibit Systems modular panel system displays. These are the strongest type of trade show exhibit panel system backwalls, engineered to tolerate the demands of the most grueling show schedule. At Trade Show Displays In Los Angeles, we offer a wide range of portable banner stands for trade shows, conventions and sales presentations. These are great low cost trade show display products that will make a good impression if you have good graphic design. Our display products include budget priced vinyl graphic and even outdoor graphic stands. A sturdy aluminum extrusion system designed to work with fabric, acrylic, wood and more. Choose from several different sizes of extrusion, single-sided or doublesided grooves and straight or bent framing. This system combines form and function with a variety of connector and accessory options, including an exclusive A/V selection. New Display Designs for Light Weight Display Walls that Say WOW! 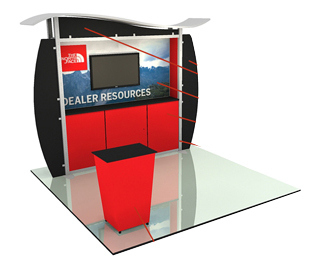 Classic, Structure and Form represent the newest Portable Trade Show Display Technology! This amazing new design in modular displays offers a wealth of options to create a look thatÃ­s perfect for your needs and stays within your tradeshow marketing budget. You can achieve professional results even from a display supplier on the internet! ContempoLite® trade show displays offer a custom exhibit look while lowering your shipping and install/dismantle costs. An entire 10Ã­ContempoLite system can be assembled quickly in about an hour and weighs less than 200 lbs. including cases. They are one of a kind exhibits to enhance your presence on the show floor. An incredible 81" wide by 84" high main graphic mural blocks the view of whatever is behind you and prominently presents your Trade Show Marketing Graphics. High quality fabric graphics are the way to go when you need visibility high up on the show floor. The idea is to be able to have either a large structure or attention getting graphic images over your booth space that accomplish two things. WeÃ­ve helped thousands of trade show exhibitors achieve a better return on their marketing dollars by providing well made, competitively priced exhibit systems as well as tradeshow graphic design and graphic production services. Our exhibit hardware prices represent 50% off savings over retail! Our Photomural and Header graphics are produced using a continuous tone, 100% photographic process, not ink jet printing. Our Products In One Place! Trade show displays in LA brings you the best of the best and the expertise that helps you make the most of your marketing dollars. We’re a business just like you and we understand what it means about the need to get a good ROI. It’s about results…and value. We’re located in Los Angeles near the LA and Anaheim convention centers and we're easy to communicate with! Form follows function, especially on the convention and trade show floor. Effective exhibit design starts with defining your sales and marketing goals and a strategy to attain them. Supporting those goals is the only purpose of your new display design concept and thatÃ­s where the custom in custom modular exhibits comes from. An exceptional array of high quality, portable, low cost Pop Up display booths made here in Los Angeles. We offer both curve and straight wall displays, Abex 10' and 20' pop up displays in addition to 6' and 8' Table top pop up displays, all with a lifetime Guarantee. Lightweight hanging signs and graphic walls for trade shows provide exceptional visibility on the show floor. Crisp brilliant color graphics for your trade show booth space. High quality aluminum and fabric graphics are the way to go when you need visibility high up on the convention and trade show floor. The idea is to be able to have either a large structure or attention getting graphic images over your exhibit booth space that brings attendees to you! See the newest designs in trade show exhibits and displays, with links to all Image Design and Communications trade show booth web sites. Each site features graphic display panels and signs, aluminum and fabric island low cost and custom trade show displays. These are the strongest type of trade show exhibit panel system backwalls, engineered to tolerate the demands of the most grueling convention and trade show schedule. These good looking, sturdy exhibit systems look and feel high end and because we sell at wholesale. The Modulus Modular is a one of a kind trade show display exhibits with laminate panel systems and tension fabric walls and towers. 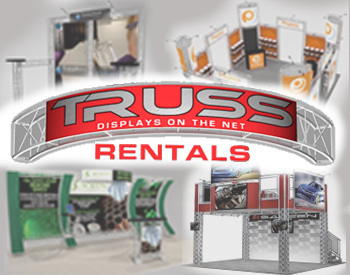 These special convention and trade show displays are reconfigurable so you can use the same exhibit for different show, venues, and requirements. This special trade show display is manufactured in Los Angeles. Lightweight hanging signs and graphic walls for trade shows provide exceptional visibility on the show floor. Crisp brilliant color graphics for your trade show display booth space. Elegant tension fabric tent shelters come in many shapes and sizes for outdoor occasions such as trade shows, fairs, shows, parties and receptions and are temporary. 10', 20', 30', we have the right outdoor tents for every trade show and event. The most common type of Tradeshow Bannerstands are the retractable Ã¬window shadeÃ® style graphic versions that can hold a roughly 33' wide X 85' tall graphic. Banner Stands are also known as Pull Up Graphics and Roll Up Graphics, a number of sizes are available including wider widths and adjustable heights to fit whatever your convention display needs are. Lightweight hanging signs and modular graphic fabric walls for trade shows provide exceptional visibility on the trade show floor. Crisp brilliant color graphics for your trade show booth space. Each display is designed to be customized to fit your unique branding needs. 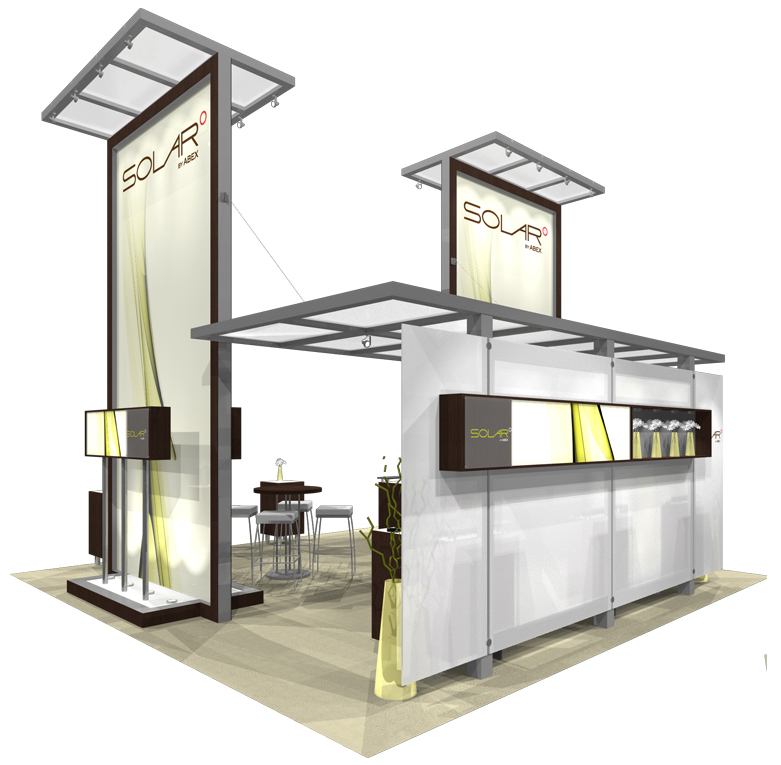 Classic, Structure and Form represent the newest Portable Trade Show Display Technology! This amazing new design in modular displays offers a wealth of options to create a look thatÃ­s perfect for your needs and stays within your tradeshow marketing budget. These classic trade show displays are actually made in Los Angeles near the Los Angeles Convention Center! ContempoLite® trade show displays offer a custom exhibit look while lowering your shipping and install/dismantle costs. An entire 10"ContempoLite system can be assembled quickly in about an hour and weighs less than 200 lbs. including cases. 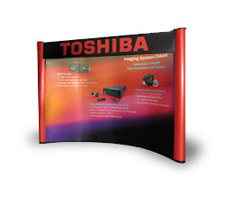 Displays on the Net specializes in high quality Abex Display products wholesale priced Pop Up Trade Show Displays. 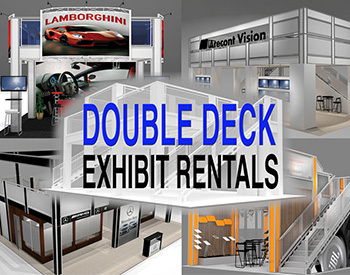 See an array of 10' exhibits, table top displays, graphic design, and marketing info. Bannerstand on the Net specializes in High Quality US made Roll up Trade Show Banner Stands and Display Booth Graphics. Exhibits on the Net arranges trade show displays by price and size. 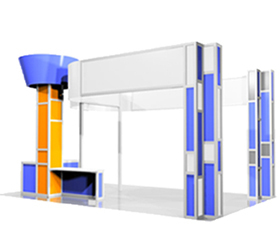 A great resource for Custom Modular Exhibit booths. Trade show displays in LA has a full range of Display Booths and Tension Fabric of all types, clients nationwide. Custom Trade Show Exhibit Booth Displays in Los Angeles, Vegas, Anaheim Tradeshow Convention Centers. Trade show booth display products by Octanorm Exhibits, Abex Pop Up Display, Moss Tension Fabric Hanging Signs. Copyright &copy; 2010 Image Design and Communications, Inc.